Extreme polarization is something new. It's also something very old. 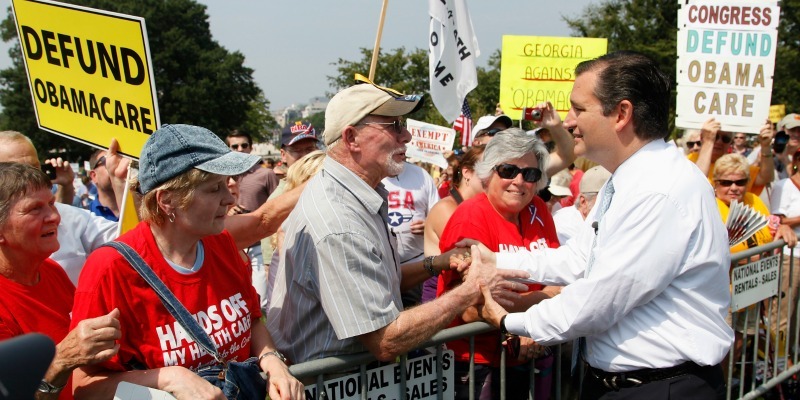 "Fund government, not Obamacare," Sen. Ted Cruz tweeted this morning, drawing a distinction where there is no difference, since Obamacare is a part of the government. If the Republican campaign to shut down Washington over de-funding the Affordable Care Act seems too silly to become reality, consider that Obamacare is no ordinary law -- and this is no ordinary Congress. 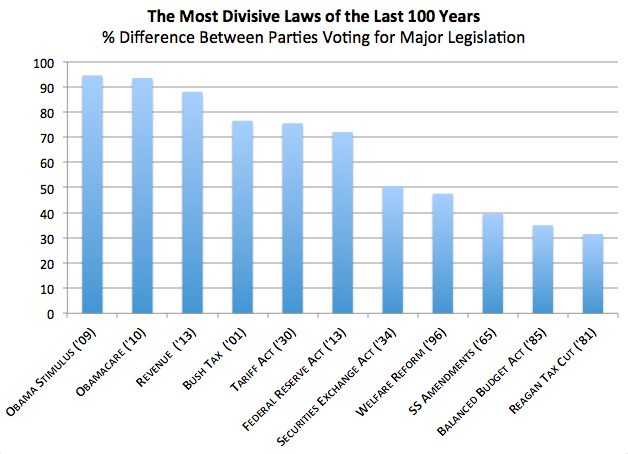 In the last 100 years, no major lasting legislation has passed over 100 percent opposition from the other party. Until Obamacare. Maybe you knew that part. But you might not know how it fits in the context of the most important laws of the last century. "In the 21st century, the concept of universal health care occurs just about everywhere in the developed world, and increasingly, in the developing world," writes Michael Cembalest, chairman of market and investment strategy at JP Morgan, in new research note. But in the U.S., Obamacare suffers from an “original sin” problem. Along with the Obama stimulus bill, it is the most divisive legislation in modern history. How do you measure most divisive? 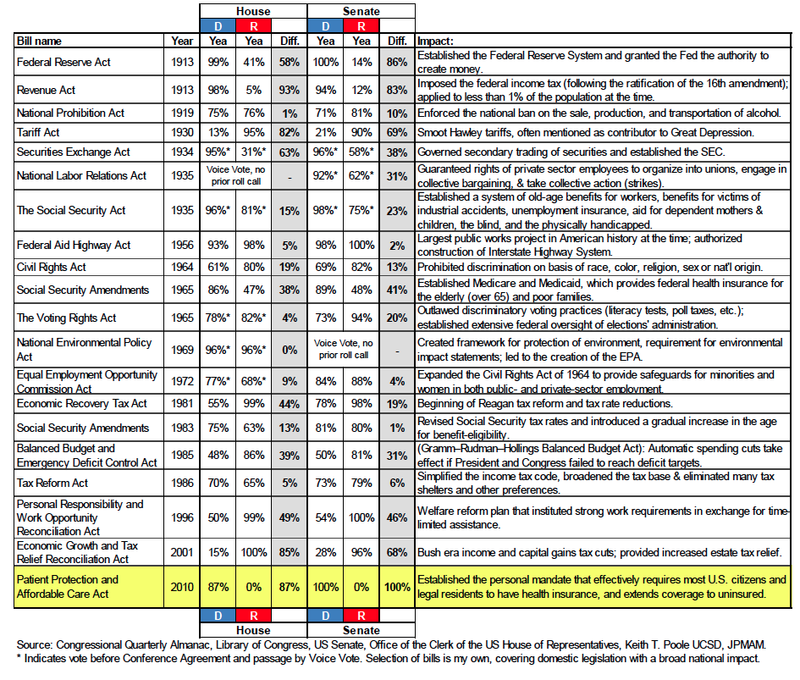 Cembalest constructed a table (see bottom of post) of the century's major legislation and the percent difference in voting between the two parties. For example, in 1956, 98 percent of House Republicans and 93 percent of House Democrats voted for the Federal Aid Highway Act, which built the interstate highway system. That's a "difference gap" of 5 percent. In the Senate, 100 percent of Republicans and 98 percent of Democrats voted for the bill -- a "difference gap" of just 2 percent. Lots to chew on here, but in particular note that polarization took a reprieve in the middle of the 20th century, but huge difference gaps are something old, not something new. Here are the most divisive laws of the century, by Cembalest's definition (he doesn't include the 2009 stimulus in his research note, but I've added it). 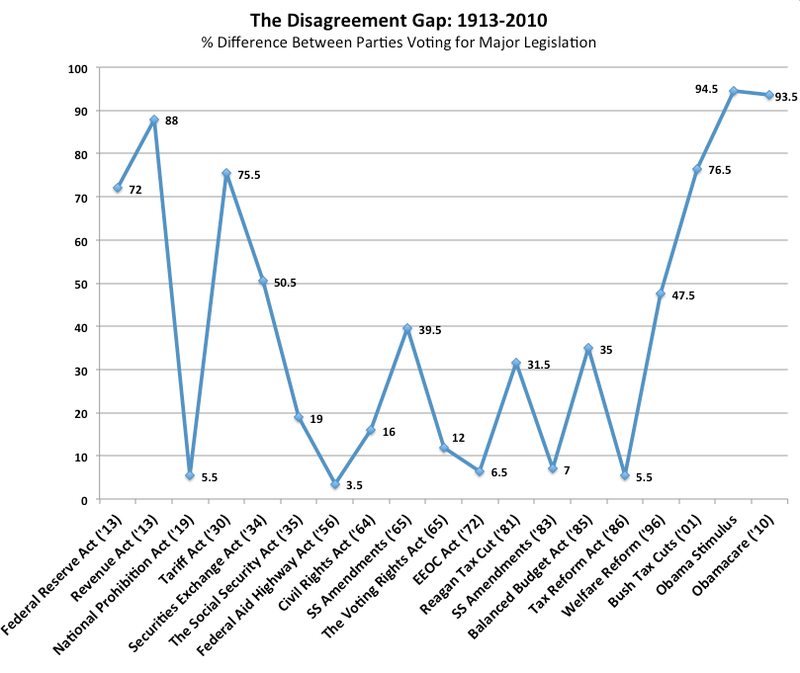 Of perhaps trivial note: No bill between 1931 and 2000 has an average voting gap of more than 50 percentage points.